As with all silver coins of this era, the 1879 Morgan Silver Dollar is composed of 90% silver and 10% copper to comply with the Coinage Act of 1873 which standardized metal content for coins among other things. 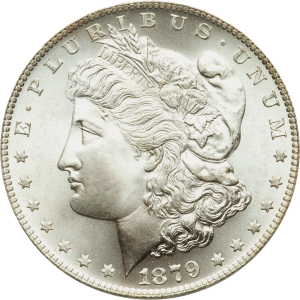 These were minted at New Orleans, San Francisco, Philadelphia and Carson City with the Carson City mintage being the most valuable. Look for a CC over CC error as well this year. CC’s worth $100 to $30,000, O’s worth $30 to $4,000, S’s worth $33 to $100, No Mint Mark’s worth $30 to $800 all depending upon condition, market, and time. For even more information on the Morgans check Wikipedia, or one of the image or tagged links below with related content.